This space has been many things in the three years we have lived here. 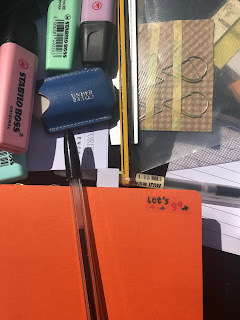 It has been an empty space, it has been a dressing table for the friends that never seem to come and stay, it has been a table for working from home and a desk for Open University - but now it is a space to create. 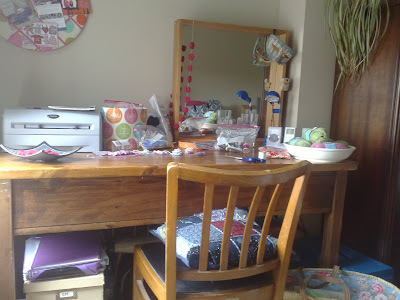 I have lots of creating to do at the moment so rather than juggle my books, yarn, sewing box etc they can now spread out and stay out. Dan has looked after Scarlett a bit lately and has been in charge of her wardrobe. Earlier this week he dressed her in a smock top. When I got home he asked me if he was supposed to have got her arms through the plastic loops. Bless. In a bid to gradually introduce her to the concept of toilet training we have a plastic potty and toilet seat residing in the bathroom. Scarlett loves sitting on the potty but thinks the toilet seat is a steering wheel so it is now known as 'car'. I'm not sure if she was a bit overtired yesterday but 'car' became such a focus of attachment that it was in the bath, held onto so tightly that I had to wrap the towel over the both of them and then taken to bed and chatted to for over two hours. I sneaked in late to gently remove it from her hand and have since hid it. The first thing she asked for this morning? 'Mummy'. The second thing ... 'car'. I say again, she is her mothers daughter!!!lol. I am very jealous of your crafting space, I want one. Have a brilliant weekend.